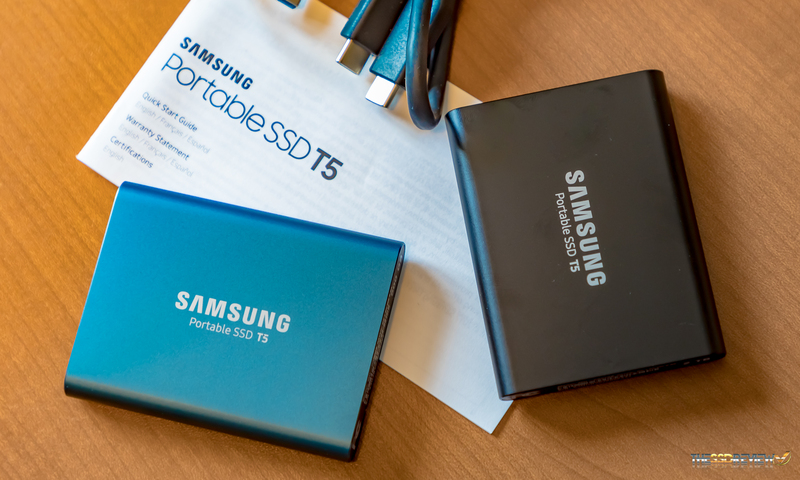 Our report today is on Samsung’ newest T5 2TB and 500GB SSDs, and at this point in the game, few might argue that Samsung sets the industry standard in all that is SSD. 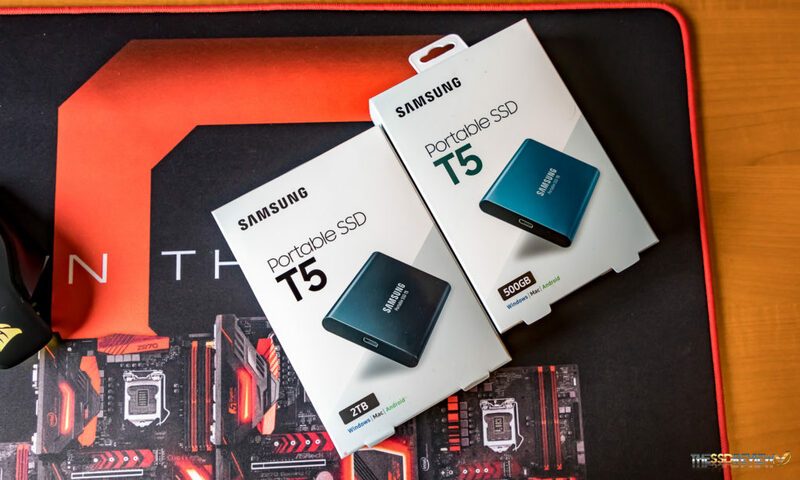 Including a 2TB capacity into their newest T5 release, as they did for the T3 prior, one might say that 2TB is also the norm… but knowing what capacity they could fit into their palm-sized external T5 SSD would blow your mind. It all comes into play with their newest 64-Layer V-NAND flash technology. It wasn’t always quite like this, however. I can remember, long before Samsung’ release of their ‘T-family’ of portable SSDs, throwing together the worlds first ‘Samsung’ 1TB portable SSD in my office. 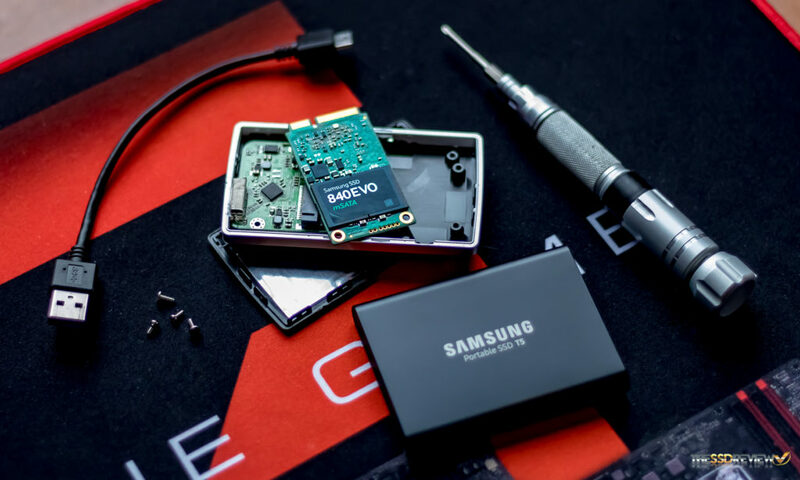 It consisted of ripping apart the MyDigitalSSD 256GB OTG Portable SSD I had just reviewed and throwing in the Samsung 1TB 840 EVO mSATA SSD we had reviewed prior. I still remember how impressed I was sitting there with the worlds smallest 1TB external SSD in my hand, one that had not only capacity and was super compact but also, it performed very well at 450MB/s with the latest in Superspeed technology. Now, that might not seem like that much but for the coincidental size and shape of that portable SSD… and the fact that it is still running strong today. In fact, I used to show that drive off to anyone and everyone who would listen. Who knows…maybe that just might have been the very first iteration of the Samsung portable SSD family! 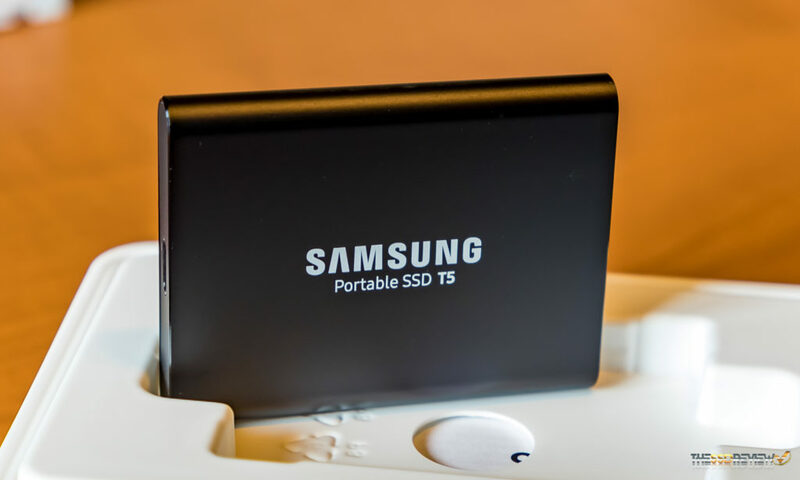 Samsung’ release of today’s Portable SSD T5 sees it being available in capacities of 250 and 500GB in blue, as well as 1TB and 2TB in black versions. It has improved from the T3 release as it is now fully USB 3.1 Gen 2 compatible and can reach speeds of up to 540MB/s when using its included USB 3.1 Type-C to Type-C cable. In fact, both the 500GB and 2TB capacities we have in hand are capable of the exact same performance and there has been no literature identifying different performance variables specific to T5 capacity. A USB 3.1 Type C to Type-A cable is also included to ensure backward compatibility with any older USB port contained hardware. The T5 is of an aluminum unibody design, weighs 51 grams, and fits very well into the palm of ones hand. There is a USB 3.1 Type-C port on one end, as well as a blue light on the same side that will illuminate during disk access. The T5 is the same size as the T3 and T1 and security software is included that puts into play Samsung’ AES 256-bit encryption and creates a totally secure data environment when a password is set. 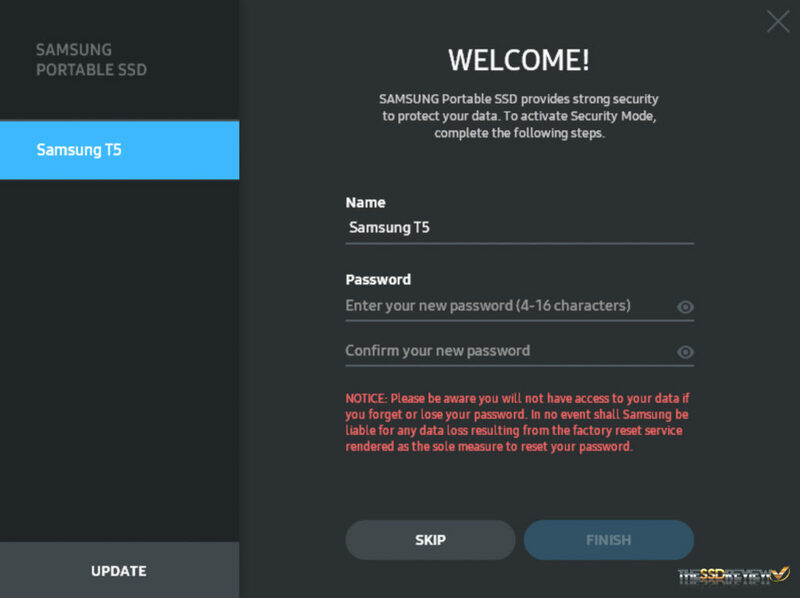 Programs are present for both PC and Android use and installation requires nothing more than setting a password and remembering it, although the software also keeps your T5 up to date with the latest drivers if and when released. The Samsung Portable SSD T5 is available today and MSRP pricing is set at $129 (250GB), $199 (500GB), $399 (1TB) and $799 (2TB), making the 2TB a mind blowing value at just $.39/GB. The Samsung T5 also comes with a 3 year limited warranty. 3 year warranty only???? forget it! a minimum of 5 years, prefer 10 years for the price. 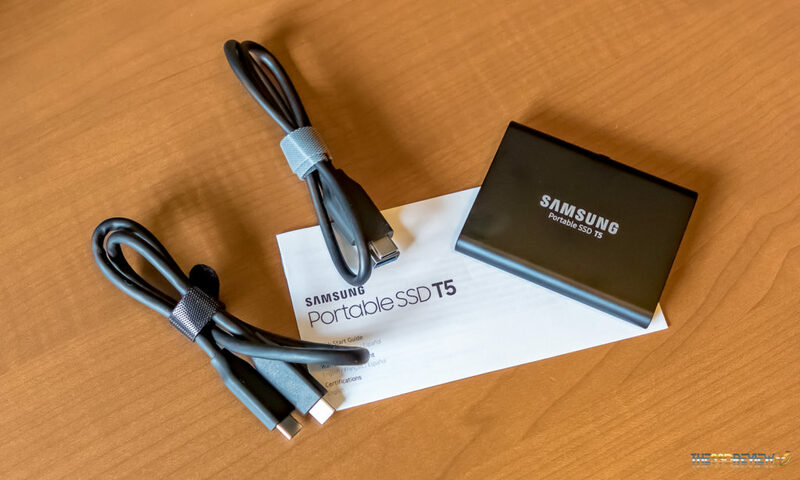 Can Samsung Portable SSD T5 be used to boot Mac and work from it all-day-long? Could you please do a teardown of Samsung Portable SSD T5? Thanks. Thanks for the reply. I asked because nobody has done it yet on Internet. That could bring traffic to your web site. Just a suggestion for your consideration. On the other hand, my original post above is the most recent on this thread, yet it does not show on top. I am using Safari on Mac latest versions on Sierra.